Just to get you orientated, this is part of the final picture from last week’s post. There’s our friend and his horse and above him the office of Hugo’s Language School. 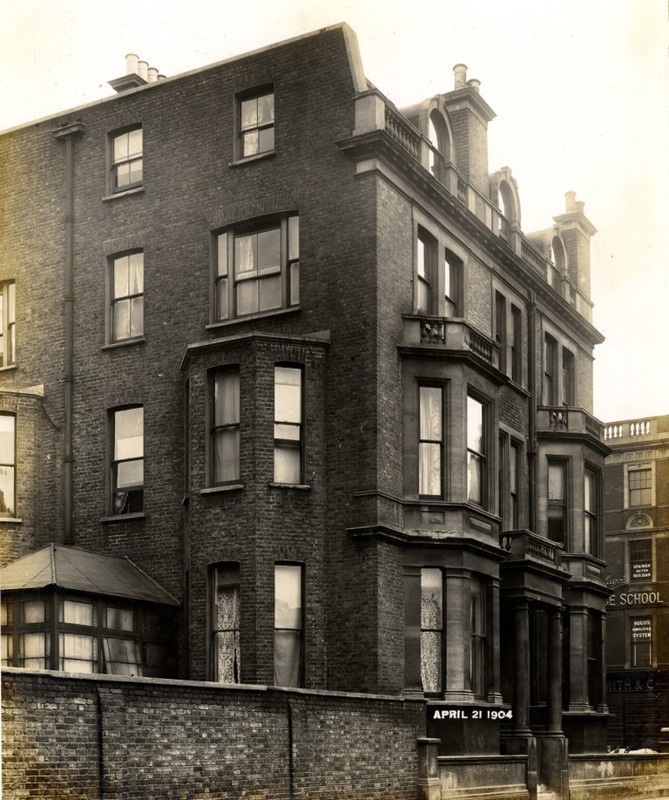 It’s the following day, April 22nd, and Ernest Milner is back on the Earls Court Road looking at the buildings on the odd-numbered side of the street. Hugo’s Language System is course still with us. 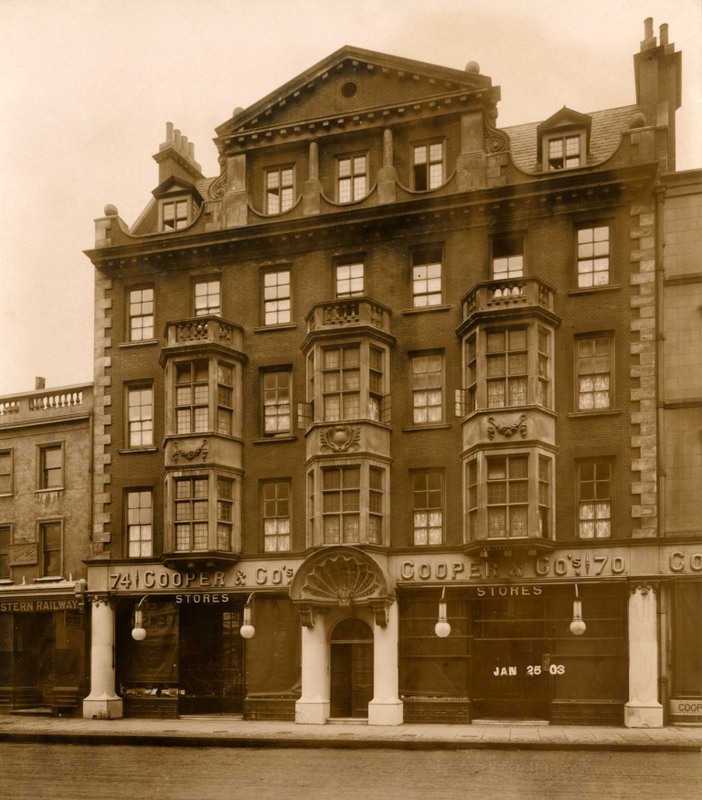 So is the London and County Bank in a later incarnation. 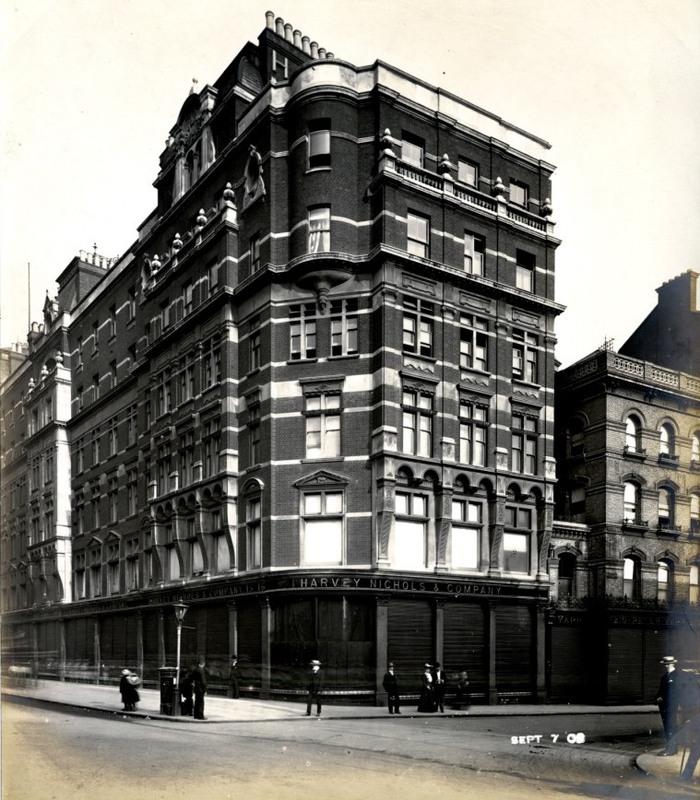 In 1909 it merged with the London and Westminster Bank to form the Westminster Bank which later became the National Westminster Bank. 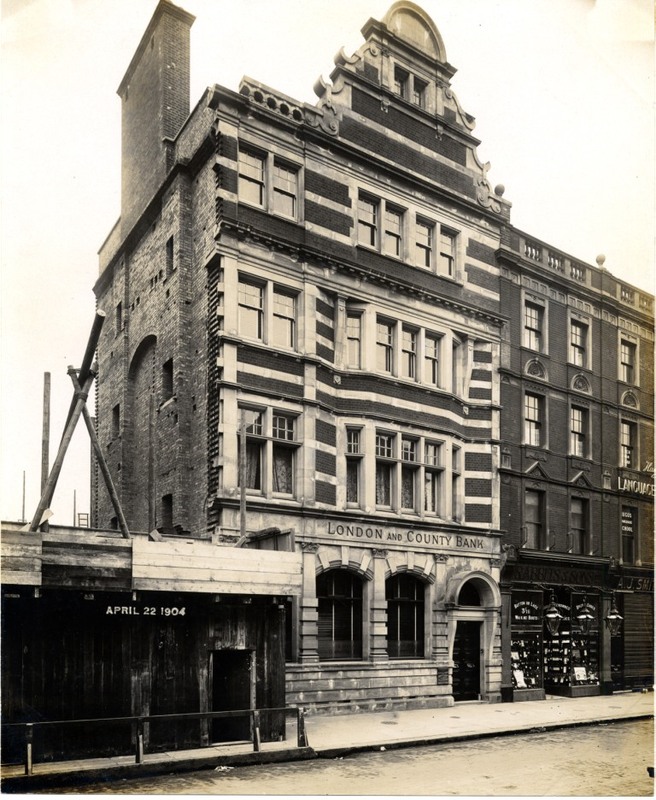 If you take a look at the same building today you will see that it has grown slightly with a matching section being built into that empty site. You can see in this picture that the empty site was quite narrow, that there were contractors in already and that the next building is another bank. 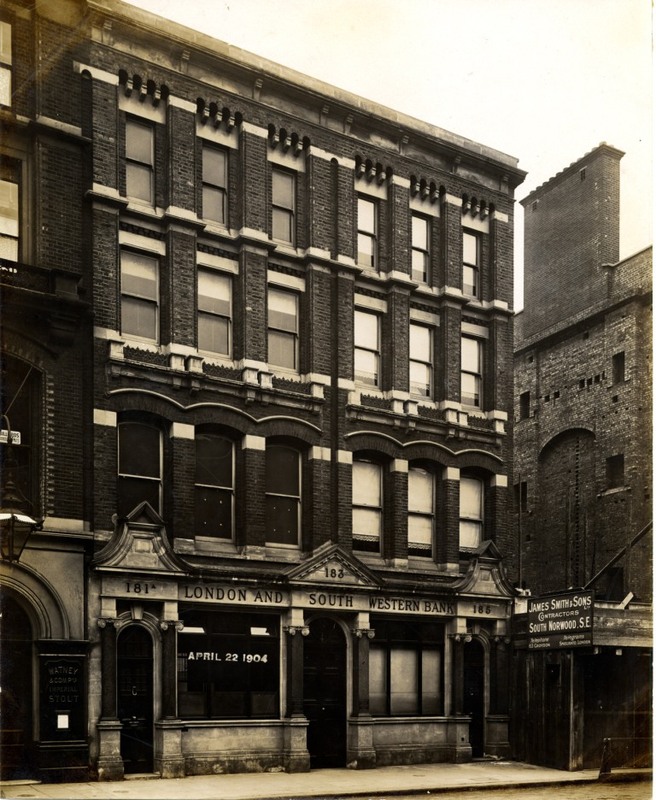 The London and South Western was absorbed into Barclays in 1918. Barclays still have a branch in this spot in a completely new building. 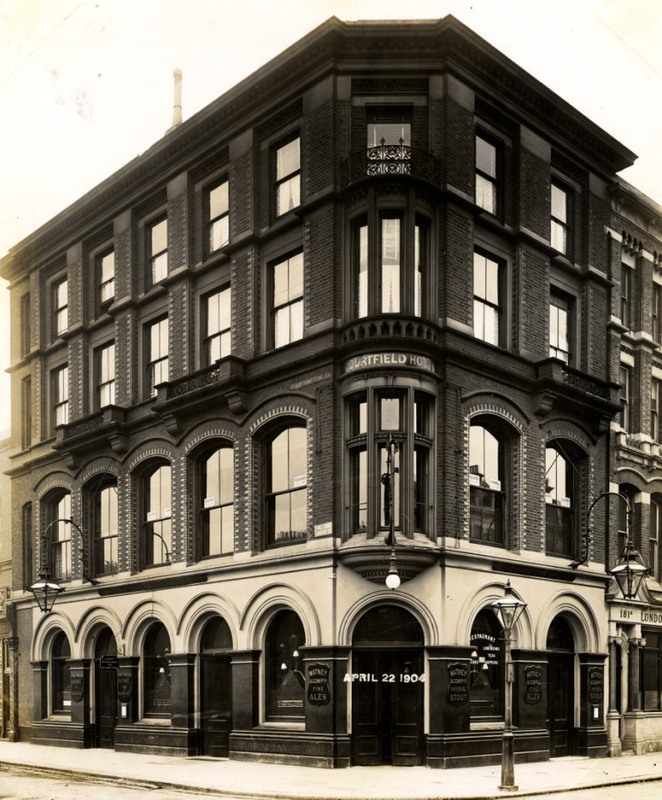 Banks are one of the great survivors of the high street. That is also true of the institution next door. The Courtfield Hotel, public house and restaurant. 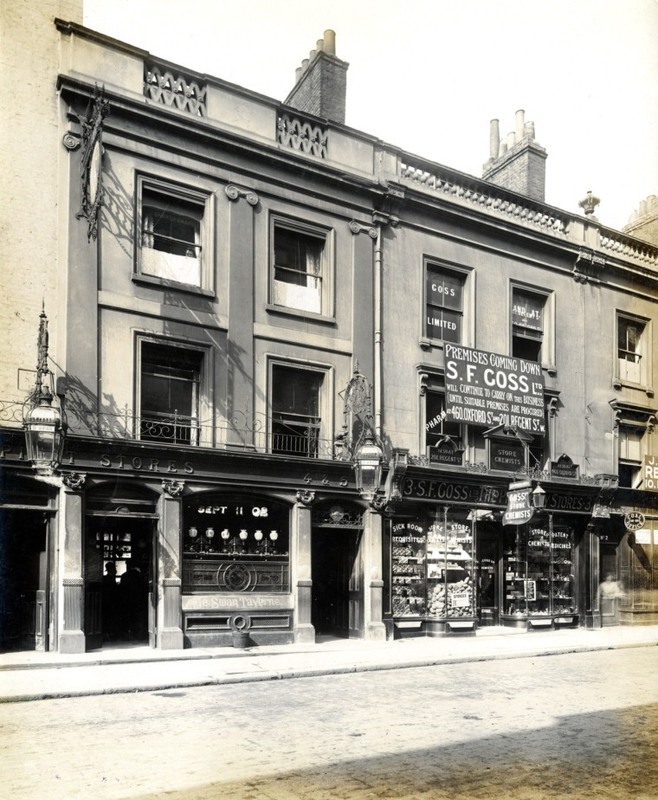 It’s now known as the Courtfield but still offers fine dining on the first floor. We’re at Earls Court Gardens now. 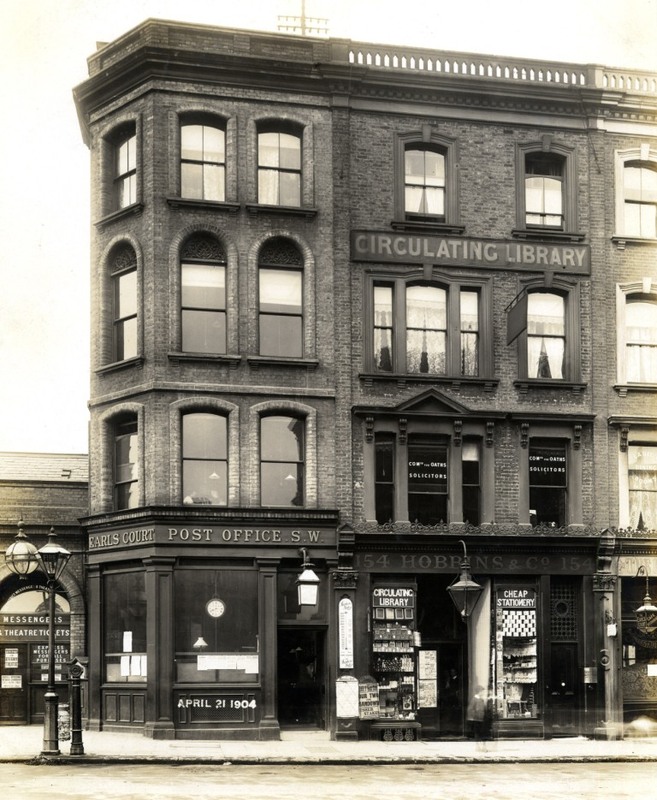 Today there is a two storey Post Office building between this street and Hogarth Road right over the railway line but Milner ignored that. Perhaps the railway company already had it covered. 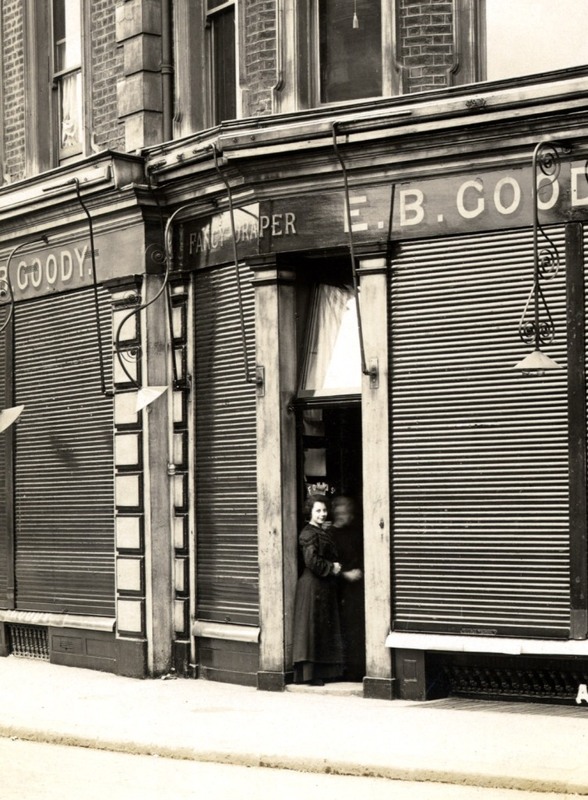 On the other side of Hogarth Road was Ephraim B Goody, fancy drapers and milliner. Just as at Edwards cross the road there is a man up a ladder making adjustments, possibly to the awnings. Upstairs Goody’s offered showrooms for baby linen and corsets. 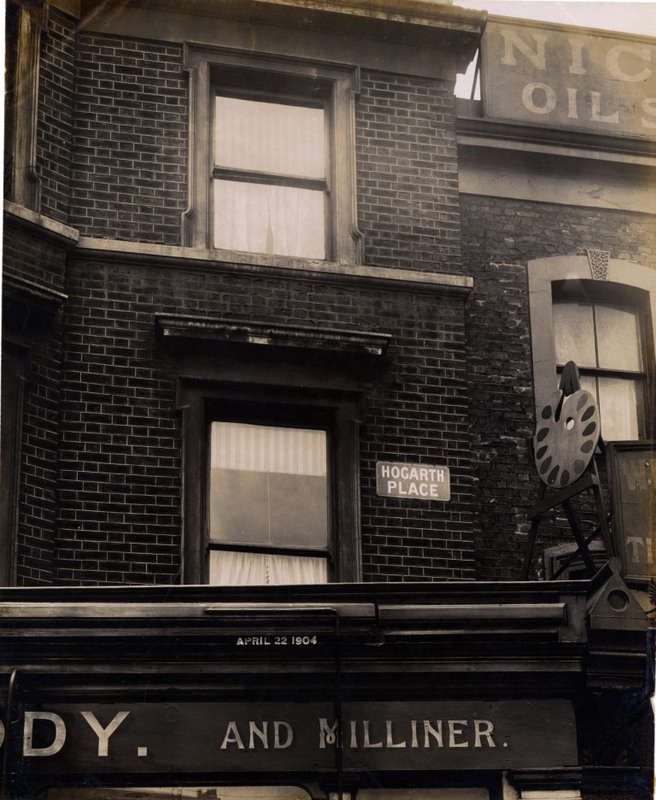 On the other side of Hogarth Road Milner didn’t take a picture of Hardiman’s, a dressmaker’s shop and not much of Whitley and Sons, dyers. 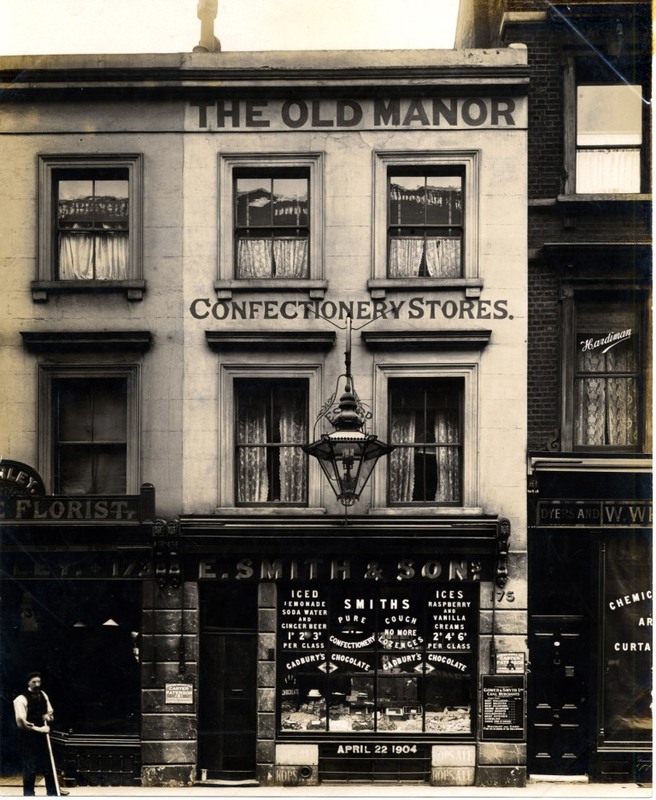 But he did cover Smith and sons the confectioners who offer lemonade and ginger beer by the glass and Cough No More lozenges. The man with the brush is from the shop next door and he also contrives to get into the next picture. 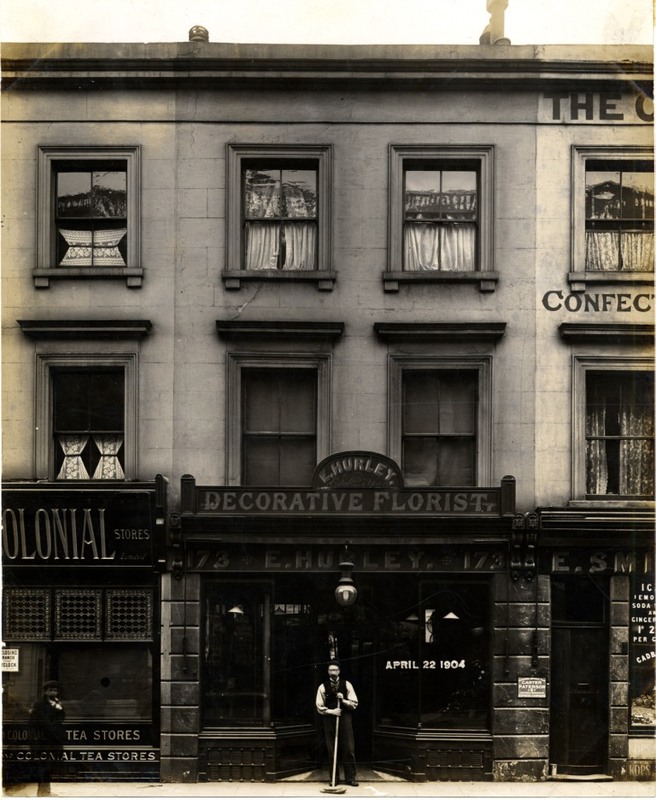 Here he takes up a proud pose outside Hurley’s Decorative Florist while another man pauses as the picture is taken. 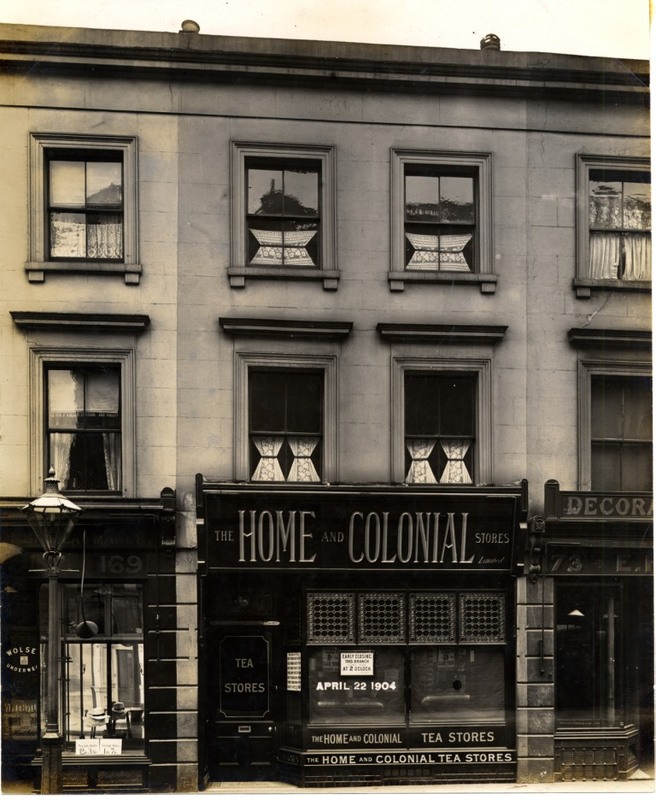 Next door is another growing chain of shops, the Home and Colonial who had over 500 stores by 1904 retailing tea and general groceries. The company was eventually absorbed into the Safeway group. I said last week we would return to J Rugg and Son, the builders who were working down the road at number 168, and here they are ready to take on any building job. 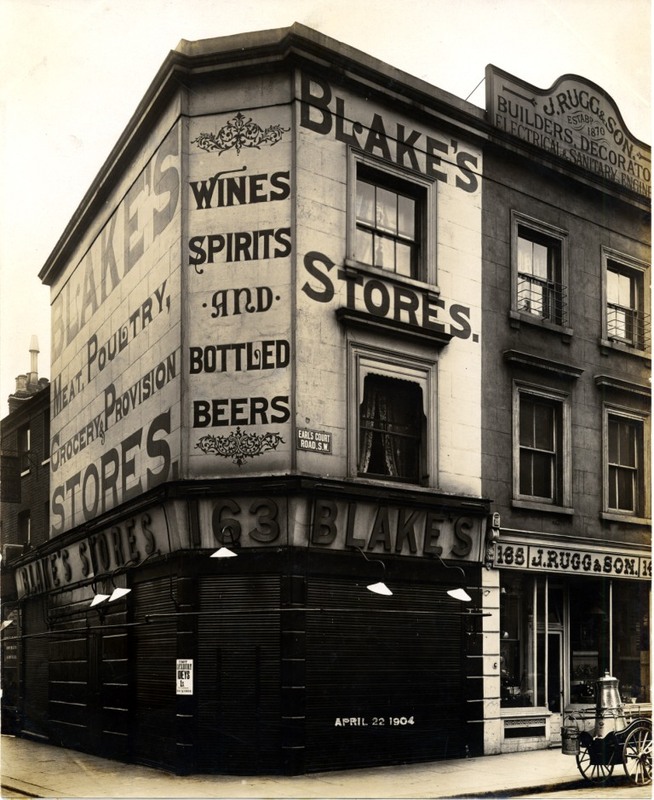 The last shop Milner photographed that day was Blake and Everett’s grocers according to Kelly’s Directory. 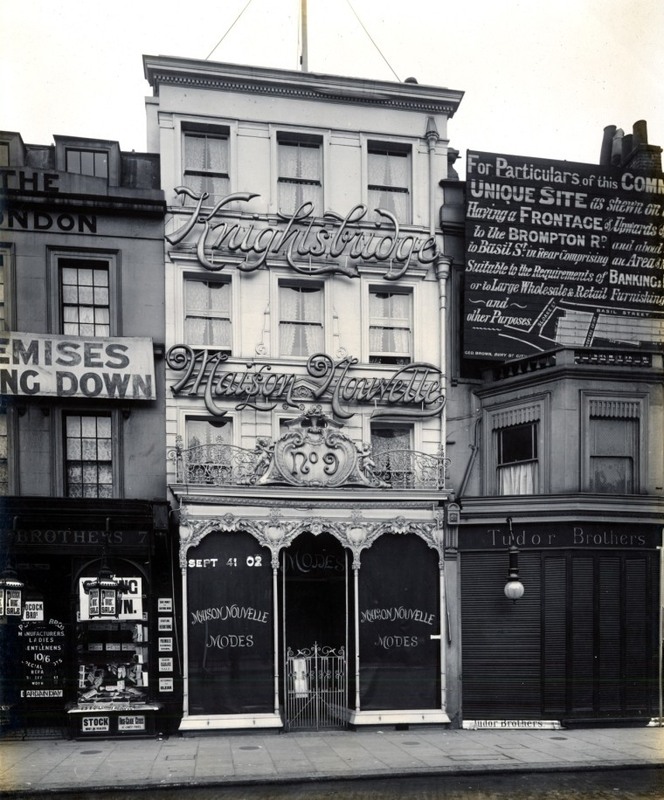 But Mr Everett was not much in evidence if you look at the classic extravagant shop front depicted here. Perhaps he was the sleeping partner, or there’s some other story we’ll never know. Check out the massive milk urn – or is that for some other liquid? 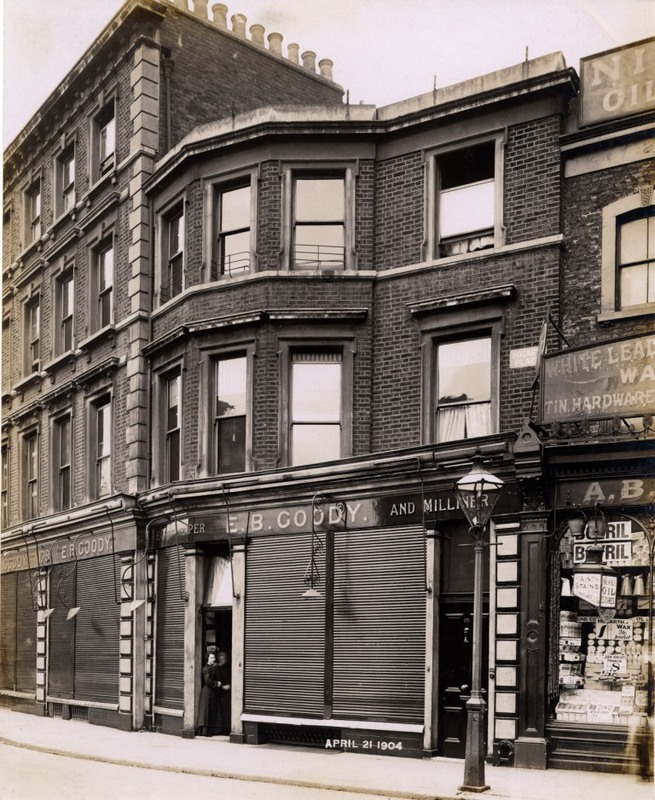 Before we go let’s take a quick stroll back to Goody’s, seen here in a side view of Hogarth Road taken on April 21st. Mr Milner took the close up view below for some reason of his own. 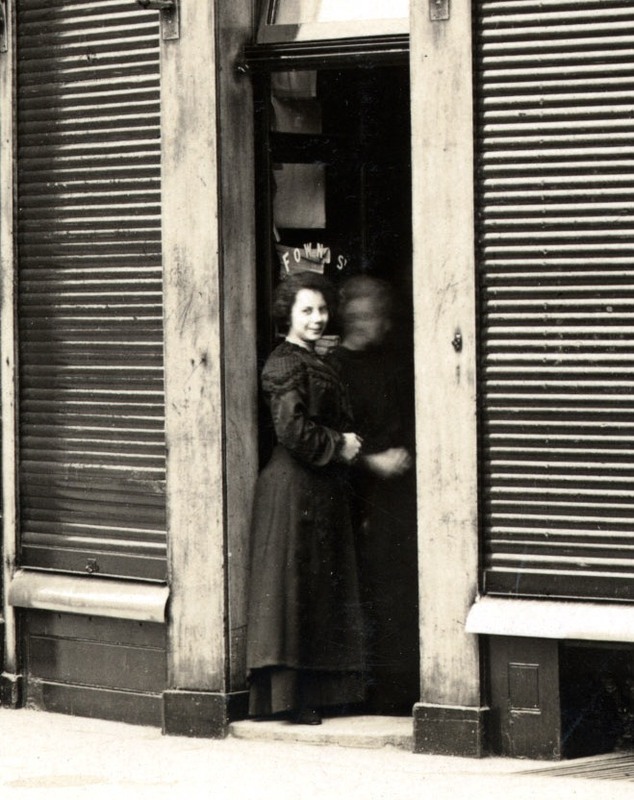 Two women stand in the doorway. One is too blurred to see properly. But I think Milner took care with the other lady, perhaps even asking her to stand still. So her slight smile and enigmatic expression was captured for us to look at more than a hundred years later. I doubt if Milner knew that would happen but I expect he would have been pleased. 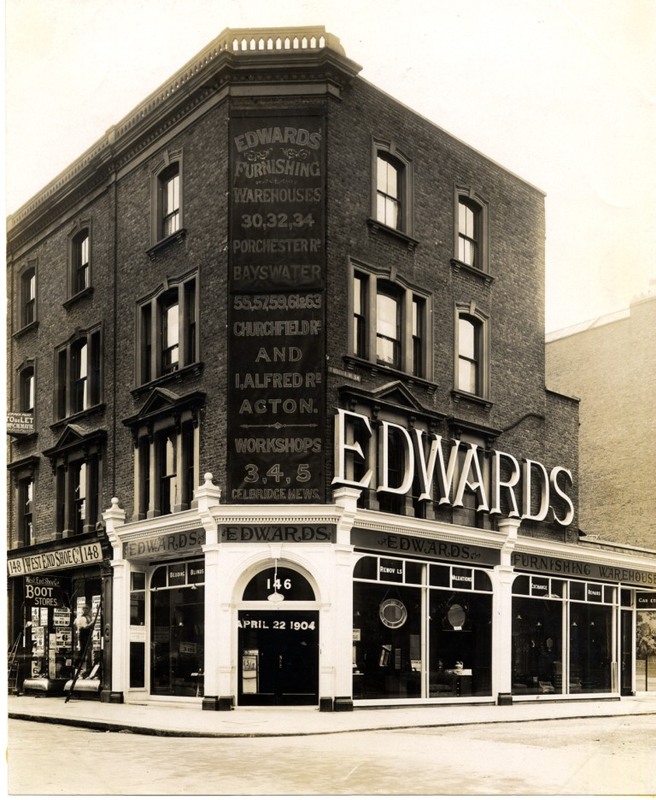 Finally on a technical note I should add that the numbering of Earls Court Road has changed a little since 1904 so those of you comparing these views with those of today will notice a few anomalies. many of the buildings are still there of course which will help. Next week my Christmas present to you, some seasonal darkness. I just heard on the radio the writer John Banville say something to the effect (apologies for my paraphrase) that the fascinating past was once as dull as the present. So this week’s pictures should in theory be especially dull. 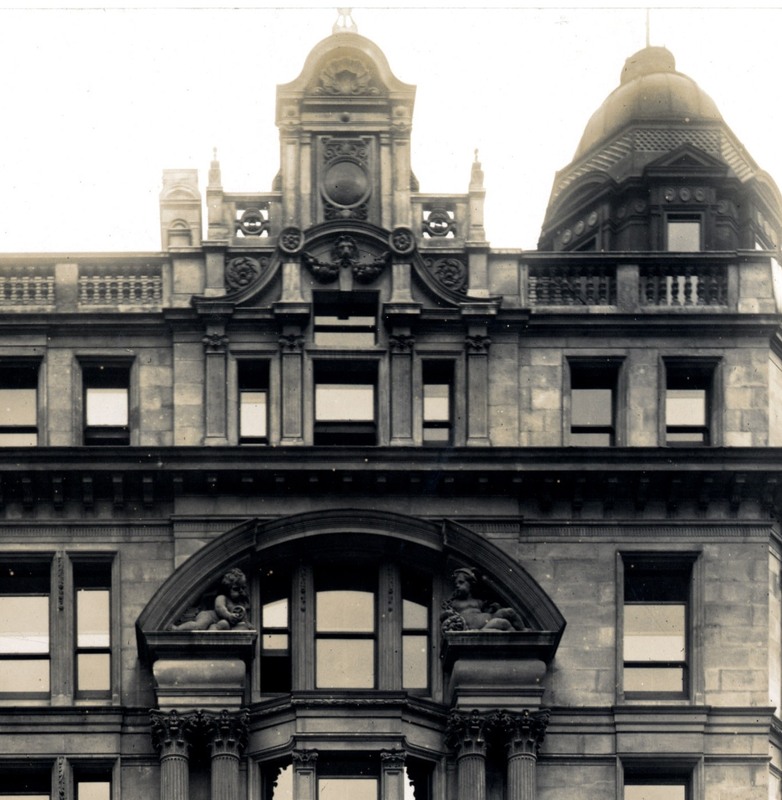 The photographer Ernest Milner was up early in the morning again in April and May 1904 to get some accurate pictures of the way buildings looked without the distractions of people and traffic. The railway company which employed him wanted some evidence of the state of buildings near or above their lines in case of legal proceedings against them. So far so dull. But interesting details and interesting people have a way of creeping into photographs. As the delivery wagon waits to be loaded its motive power has some breakfast. 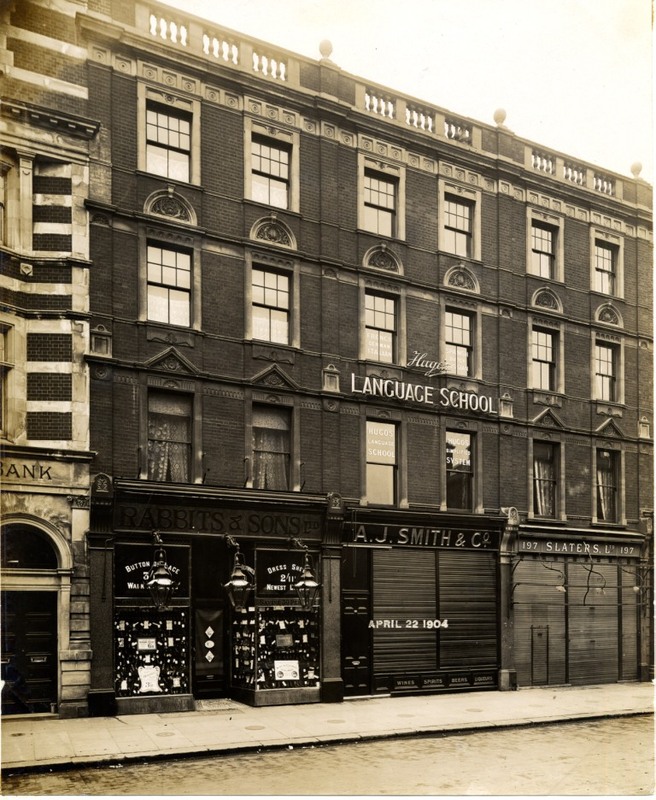 Not the same day, although I wish it was, around the corner a man half way up a ladder at the West End Shoe Company notices Mr Milner. You can see those insistent big letters better in this picture announcing to the world the size and importance of the furniture warehouse. 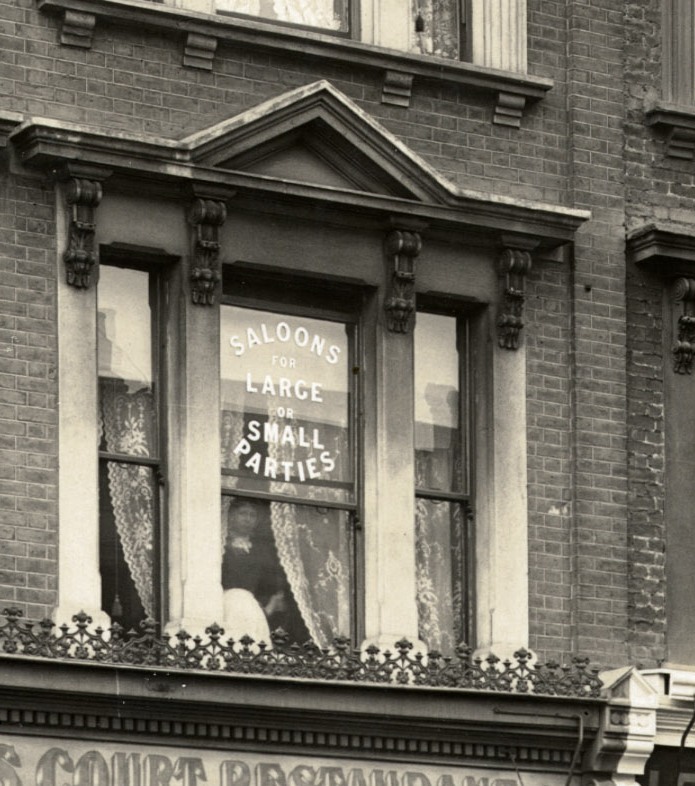 From the saloon a curious waitress keeps an eye on Mr Milner. Messrs Lanzani, Dolcini and Peechi are the proprietors of the restaurant. Is one of those her surname? The dog isn’t interested in photography. I don’t think he’s waiting for an appointment with the solicitor, unless the solicitor is bringing him some sausages. Milner hasn’t taken a picture of the whole station. But of course he didn’t have to – he was working for the railway company and they were not worried about their own property. He has given us a ghostly policeman and an odd looking ticket machine (I’d like it to be a “What the butler saw” peep show machine but that isn’t likely). 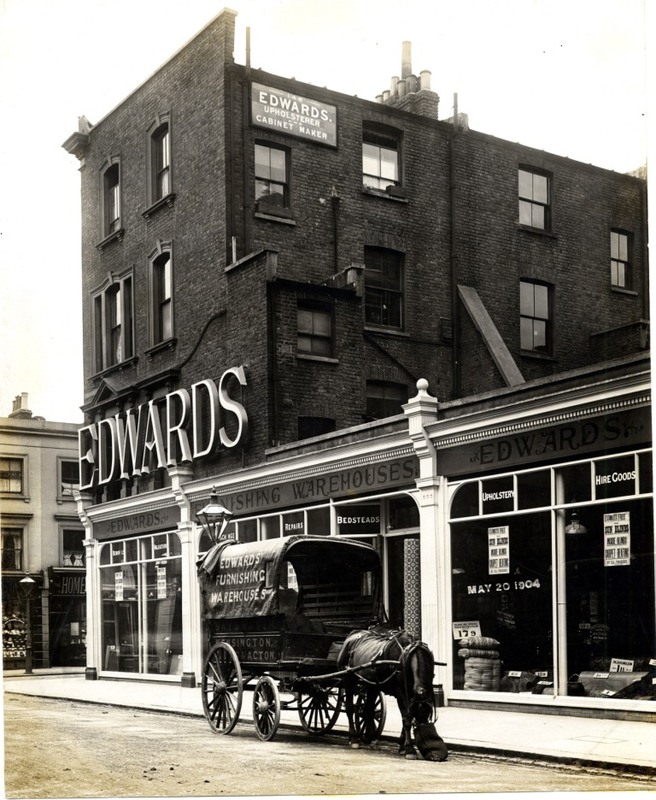 Redman the wine merchants and Thomas A King, coal merchants were still in business but there is a branch of Boots which wasn’t there in 1904. 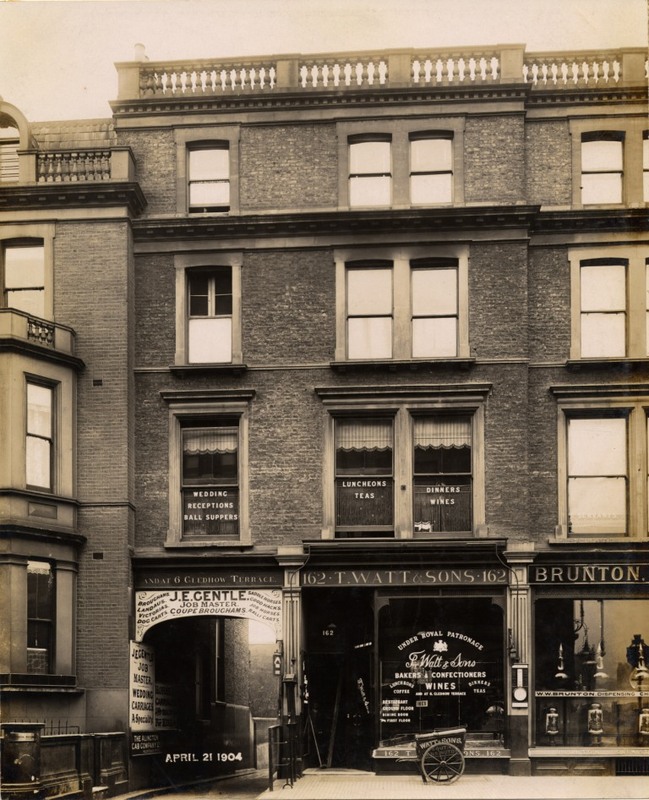 Brunton’s was a dispensing chemist – the classic set of large dispensing jars are in the window, and next door are Watt and Sons, bakers. 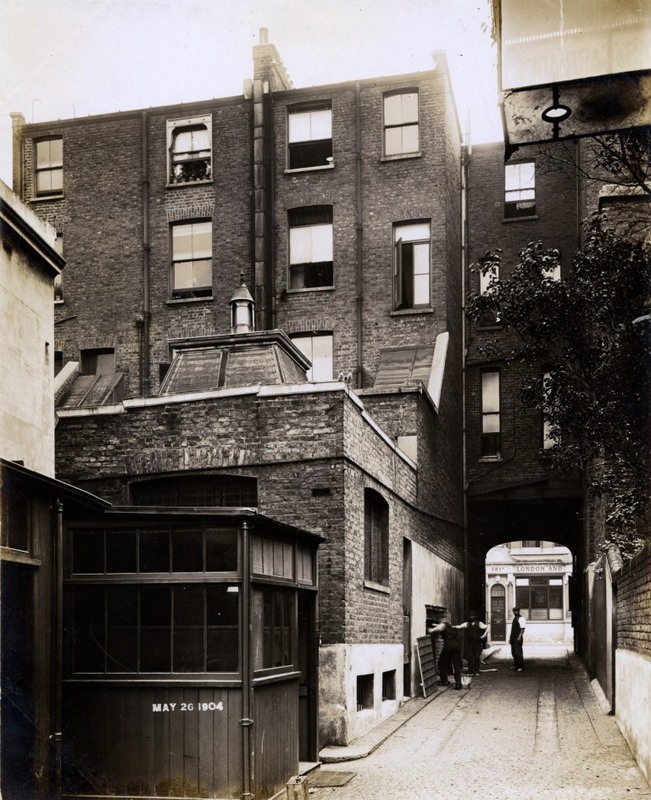 The alley is Old Manor Yard where J E Gentle, Job Master can be found. Shall we go down there? Milner must have come back a few weeks later to check the back of the building. After this point the retail establishments give way to residential properties and professional consulting rooms. 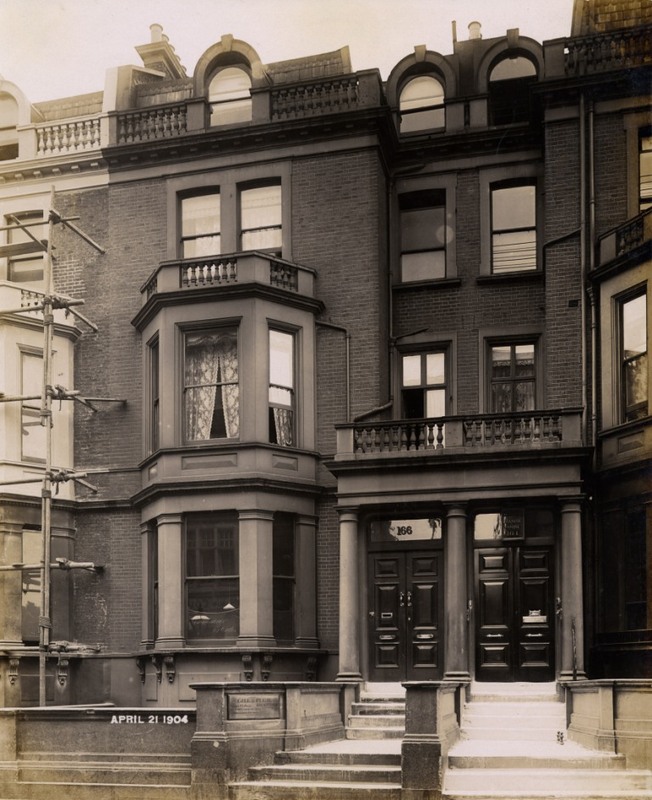 At 164 were Whitcomb and Percival, physicians, working next door to Gill and Pugh, solicitors who shared the house with a Mrs Gale. 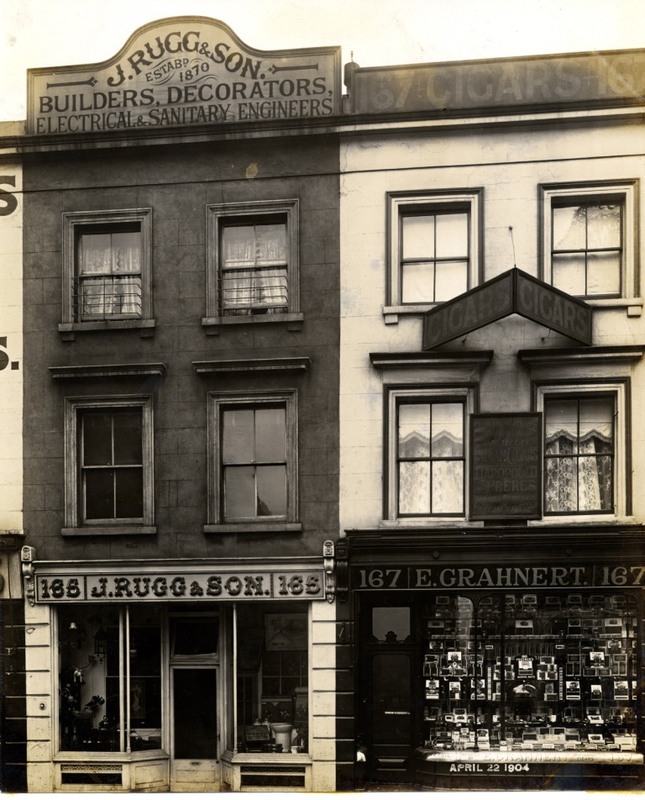 You can see that 168, unoccupied in 1904 has the builders in. 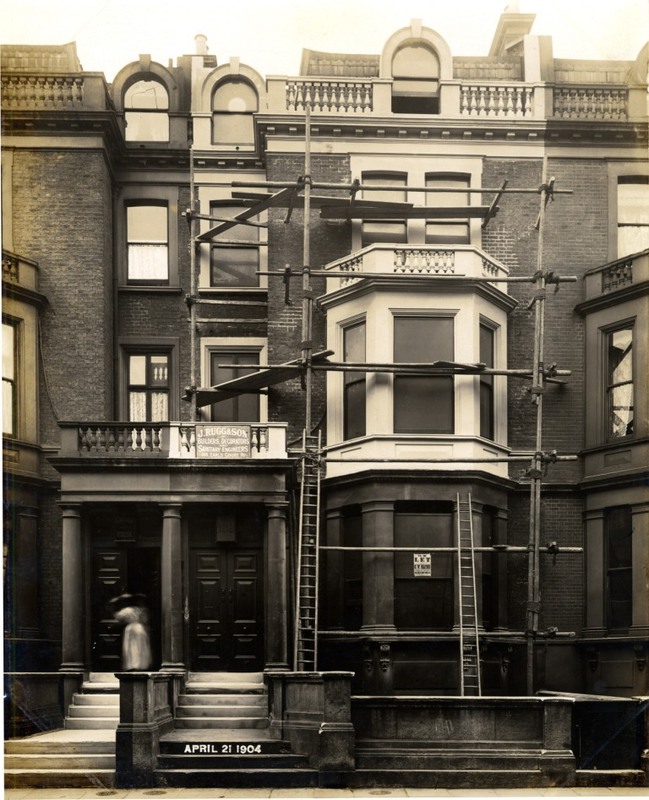 The men at work are J Rugg and son who we will see again but I’m not entirely happy with that ladder lashed to the scaffolding at a precarious angle. 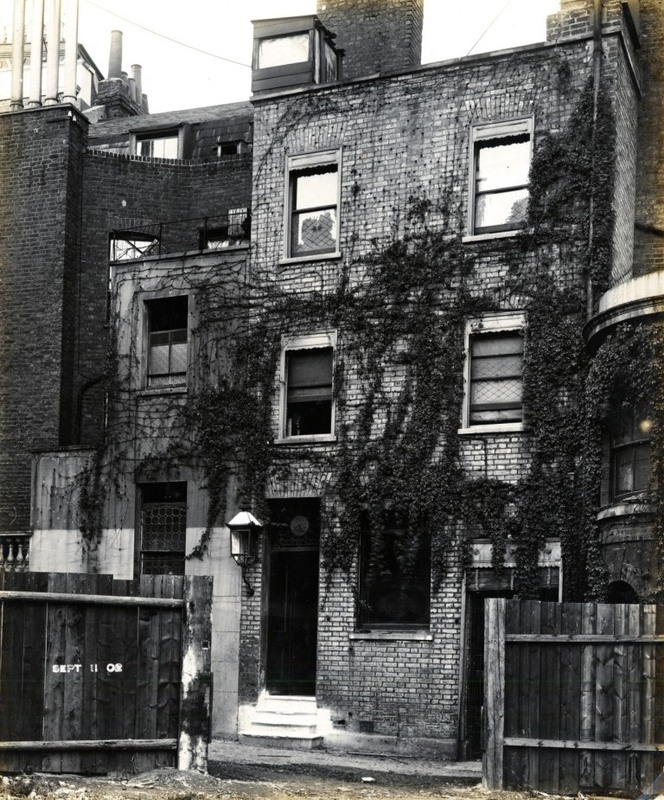 Next door at 170 (and 172) Mrs Beesley runs a boarding house. The woman in the doorway must be a maid. She’s working herself into a blur of motion and completely ignoring Mr Milner. After exposing that plate he went round the corner into Penywern Road to take a side view of the house. A young man and the back of another horse are just visible. And as we came in with a horse we’ll leave it there. 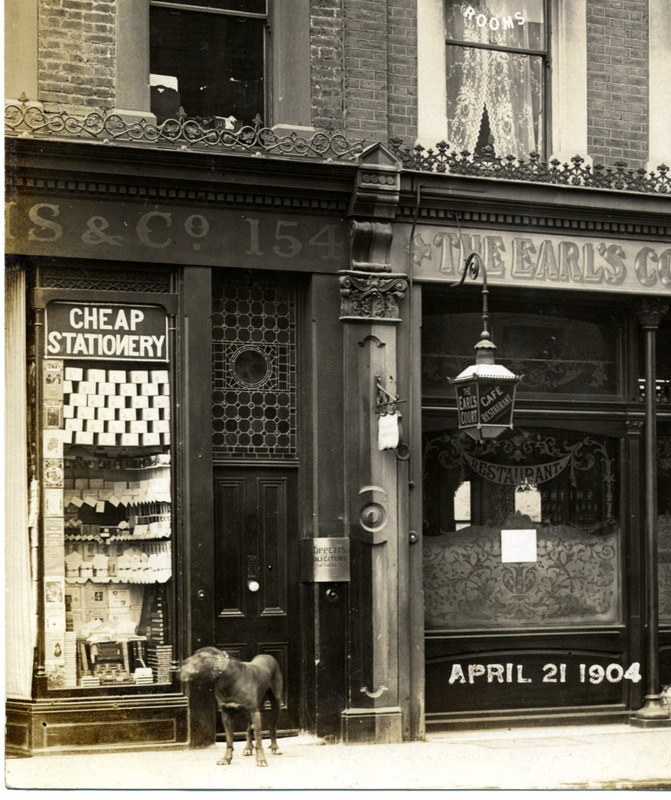 I don’t know about you but I never tire of these photographs and the details you can find in them, so next week we’re crossing the Earls Court Road to take a look at the odd numbers. The rear view of these buildings reveals a strange jumble of shapes and styles. 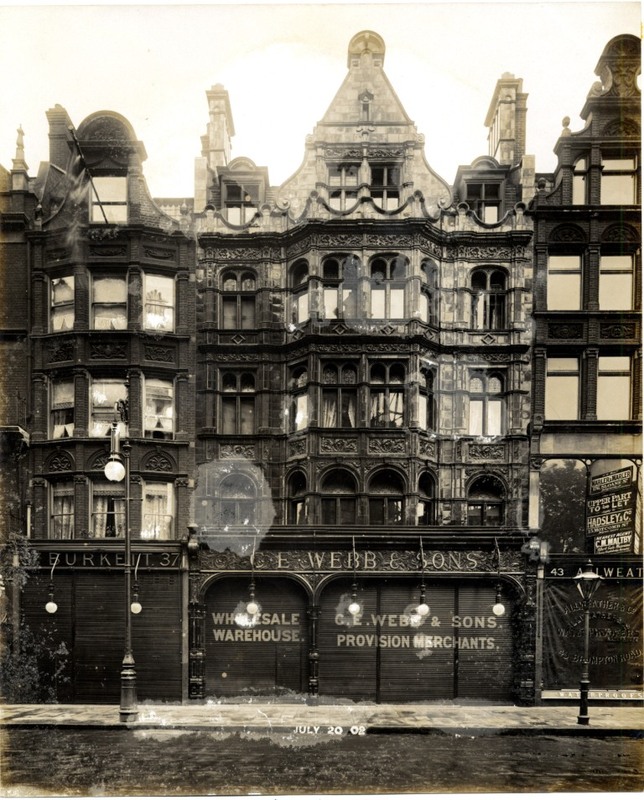 The middle one is the back of number 4 Sloane Street, the Swan Tavern. Round the corner is the front. If you look closely you can see two men doing some early morning drinking. Or perhaps they’re looking for someone. Check out the second floor window. What’s that guy looking at? It is an unwarranted assumption that he’s looking but doesn’t want to be seen? He could be looking down waiting for the two men in the bar to leave. He could be intending to make it out the back way. Or maybe none of this is true. It could just be my suspicious nature. If we move up the street past the ghost of the person who didn’t stand still long enough for the camera you can see that J Carver is on the move. 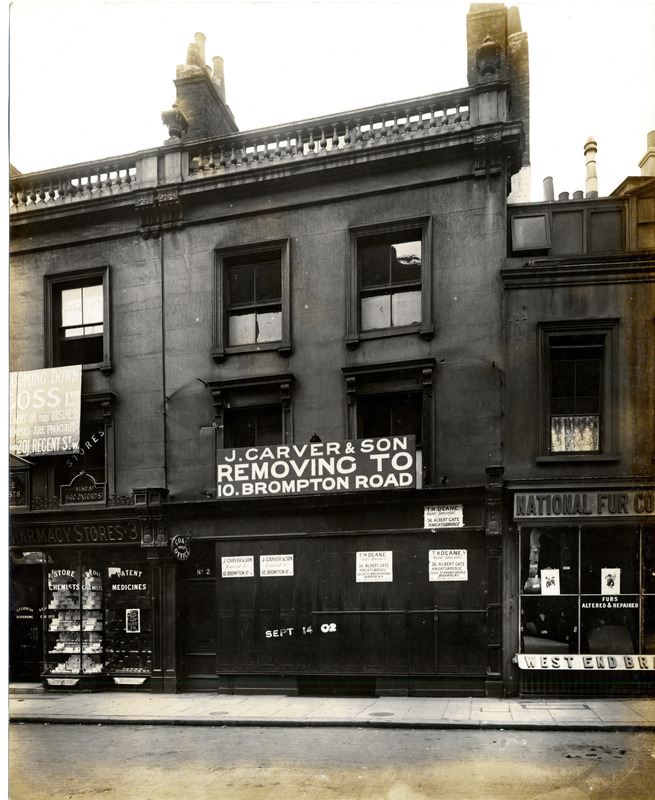 Although 10 Brompton Road is not too far to go. Past the National Fur Company it’s hard to tell if Barnard’s Restaurant is still secured from the evening before or if they too are closed for and ready to move. Sloane Street is eccentrically numbered, consecutively down each side of the street so across the road from 1-5 you have 207. 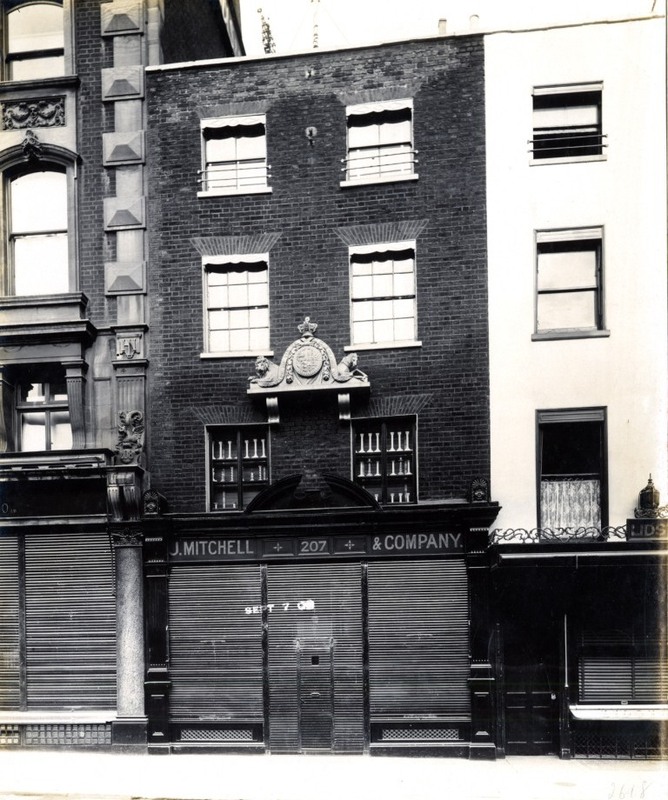 Mitchell and Co are high class grocers with a Royal appointment insignia above the shop. 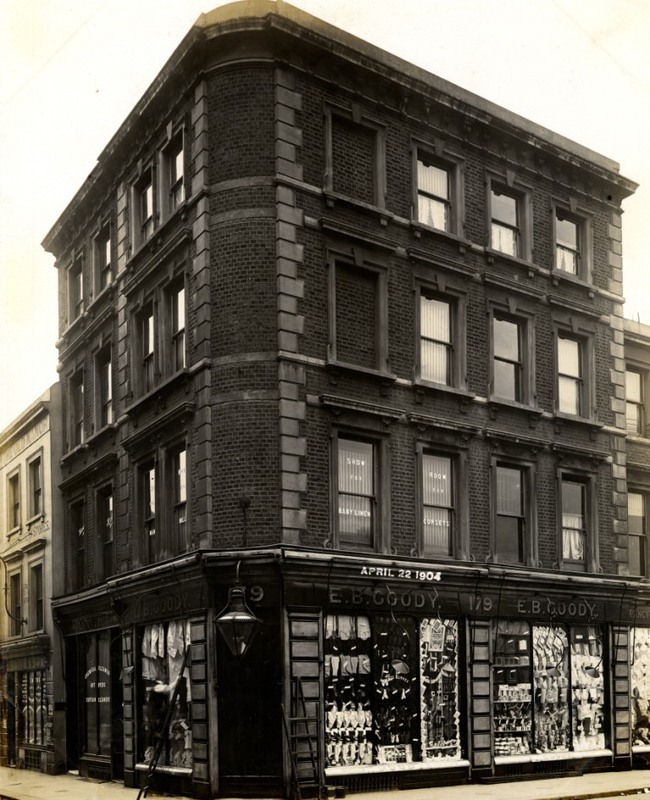 At 210 Peter Yapp had a boot maker’s business sandwiched between two outposts of the original Harvey Nichols store. See the woman in white just visible on the left, the first of a particular group of morning people. 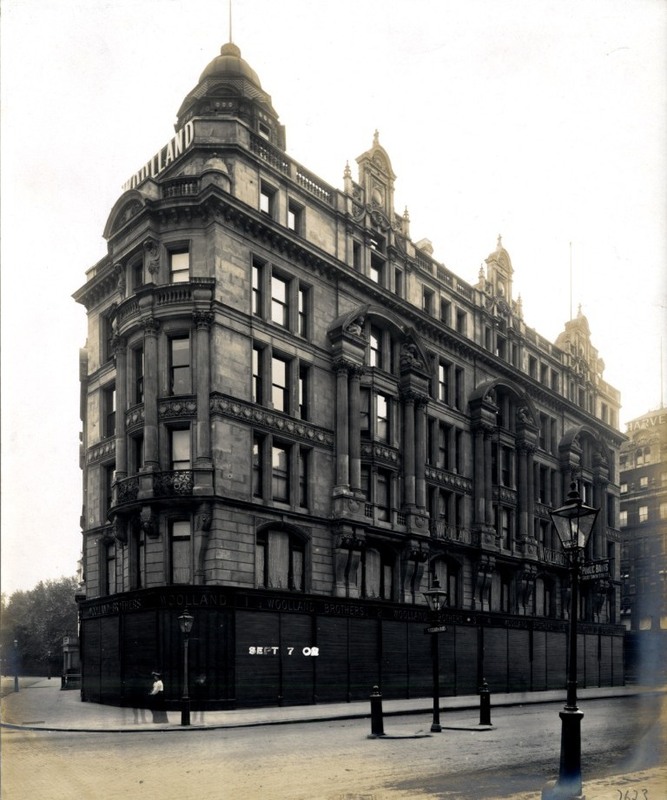 Harvey Nichols is listed in the directories as a draper’s, but they were already becoming something much bigger. They look too smart to be just hanging around for no reason. 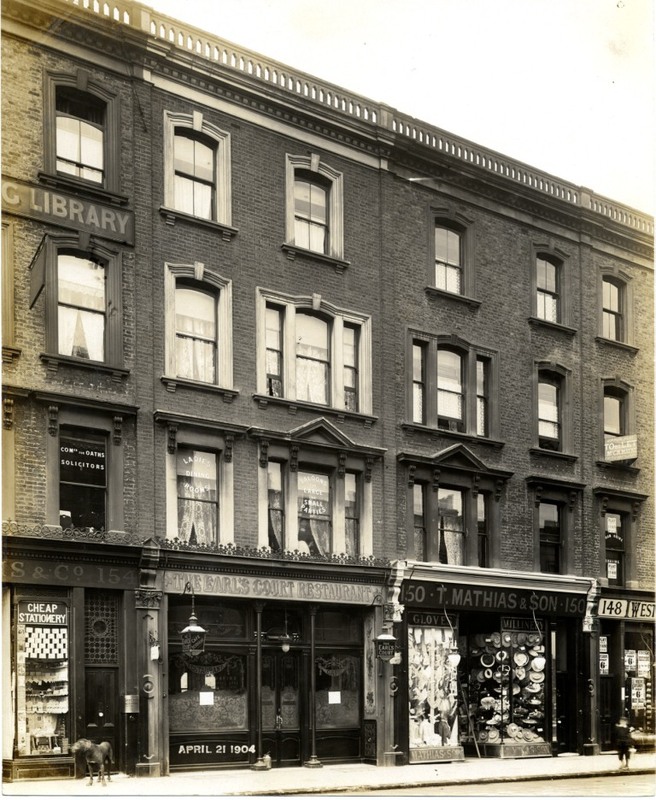 Our photographer Ernest Milner (my apologies to him for not naming him in the previous Empty Streets post) was assiduous in his task to record the buildings under which the Piccadilly Line would run. As in Sloane Street he also found his way around to the back of the building. Three more men waiting to get into the building to start work. You wouldn’t want to be late I imagine. 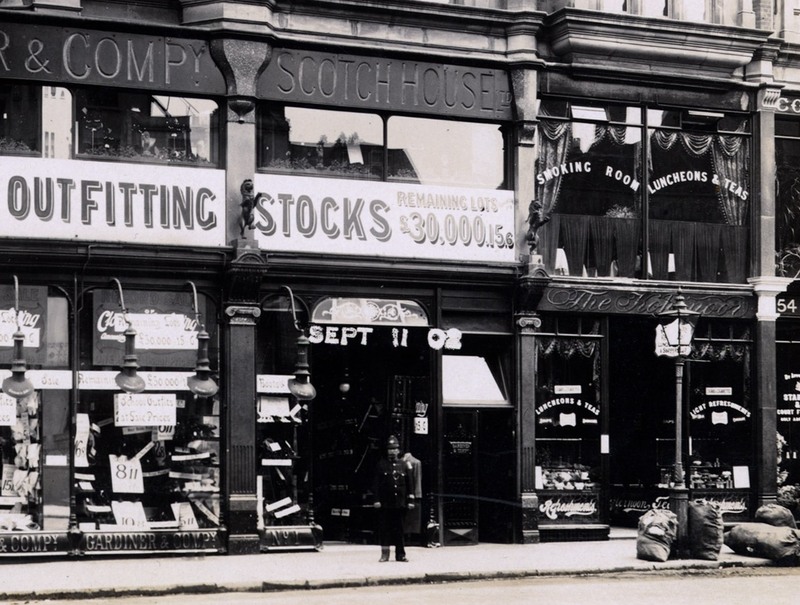 In 1902 Harvey Nichols had some competition. On the other side of Seville Street was another large draper’s store. 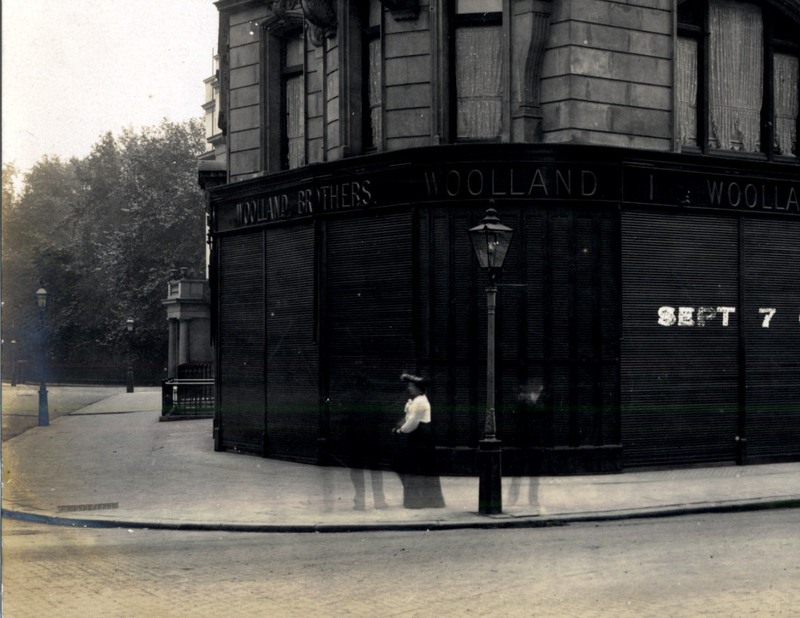 A lone boy waits in front of Woolland Brothers who traded from a rather more impressive building than Harvey Nichols. Quite a grand facade I think. 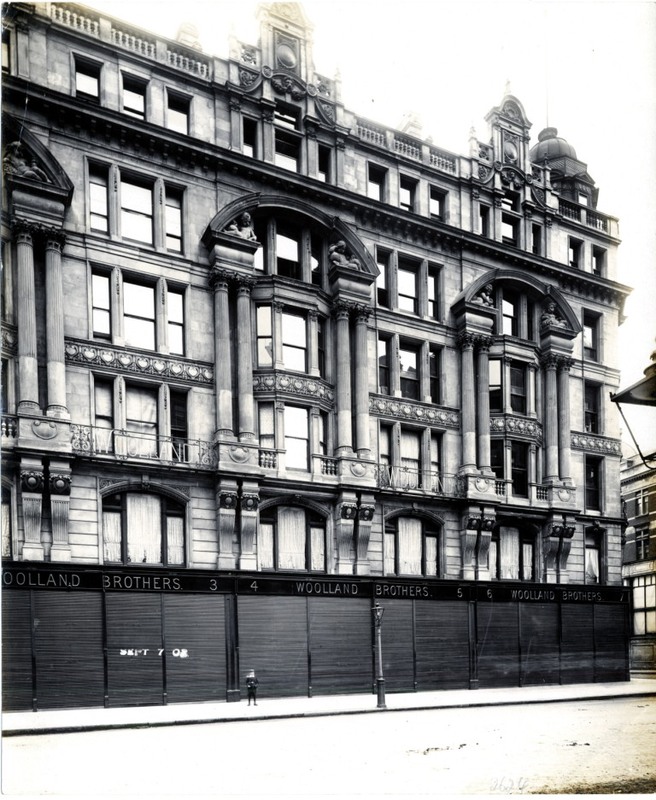 Maybe it was just the luck of the drawer that Woolland Brothers ended up in a finer building. 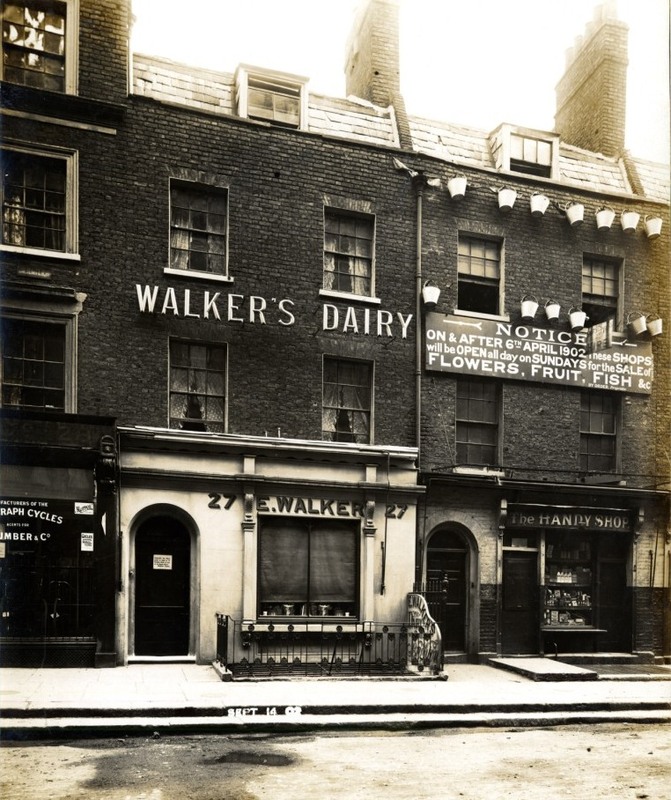 The next picture takes us right to the border of Chelsea with the City of Westminster. We can’t go any further today. 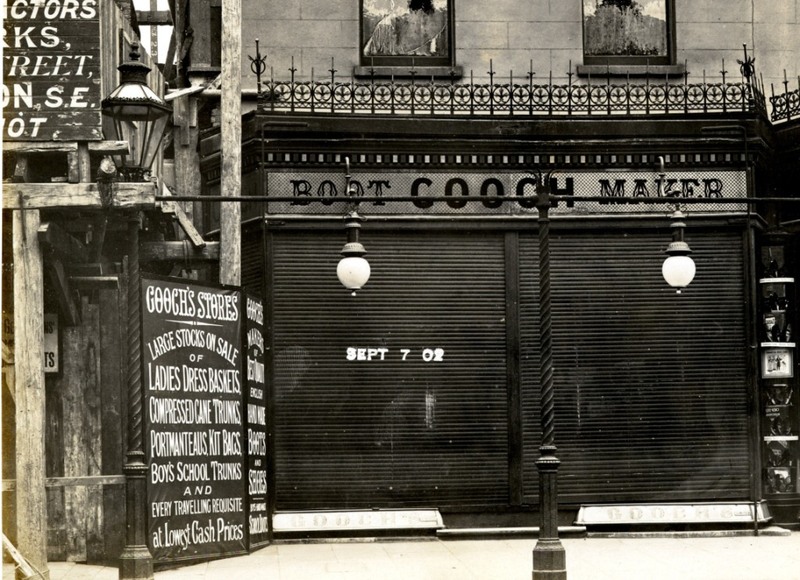 See how both stores have their names displayed in the same position on the top floor so you would see them as you walked down Knightsbridge or better still, rode on an open top bus. 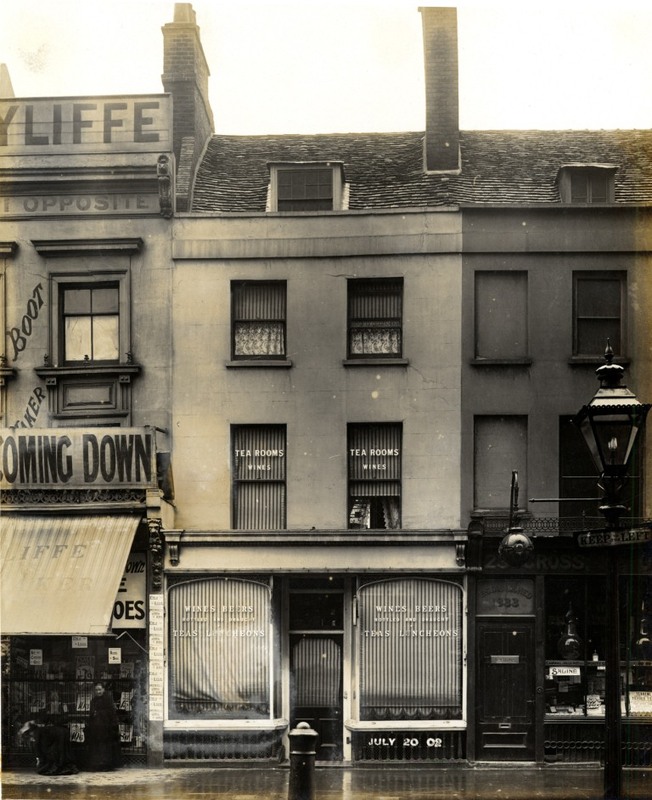 At the left of the picture down William Street you can see the trees of Lowndes Square. 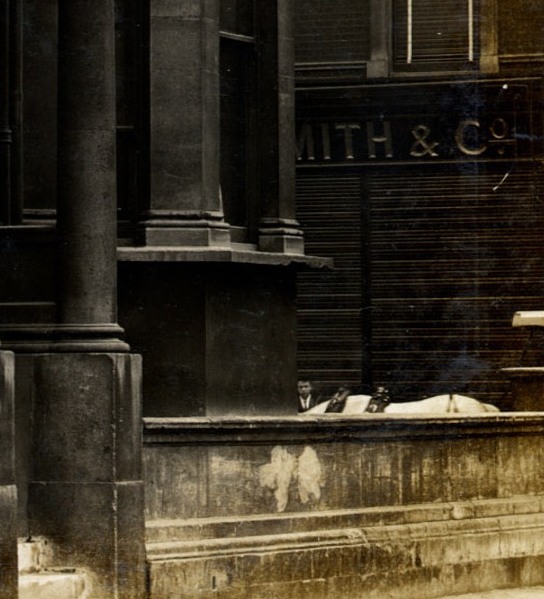 In the foreground three people have found themselves in Mr. Milner’s photograph. The two men have faded more than the woman. She lingered a little longer before going into Woolland’s. 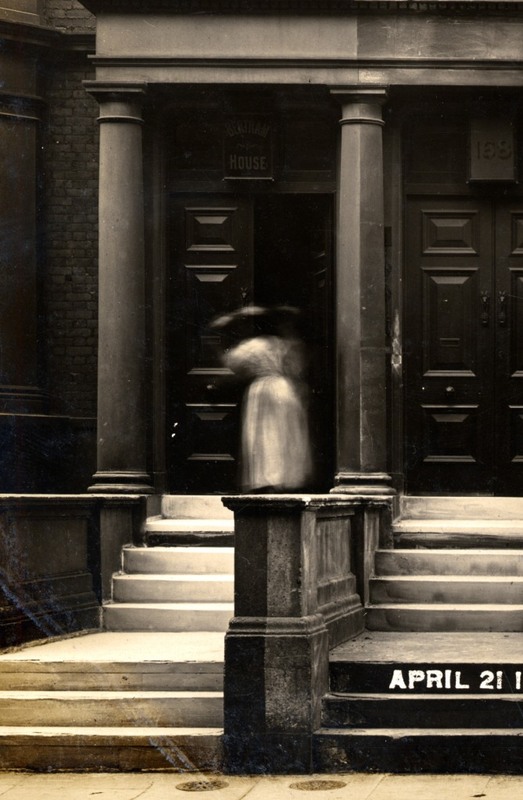 In one brief moment she stood alone on the pavement in her distinctive Edwardian outfit of white blouse, dark skirt and wide-brimmed hat. Is she carrying a coat or an umbrella? Was it a warm autumn morning as she briefly faced Milner’s camera? Was she curious about the early morning photographer? Did she know I would be looking at her image and asking myself unanswerable questions about her more than a century later? Time to get back to Maison Nouvelle. 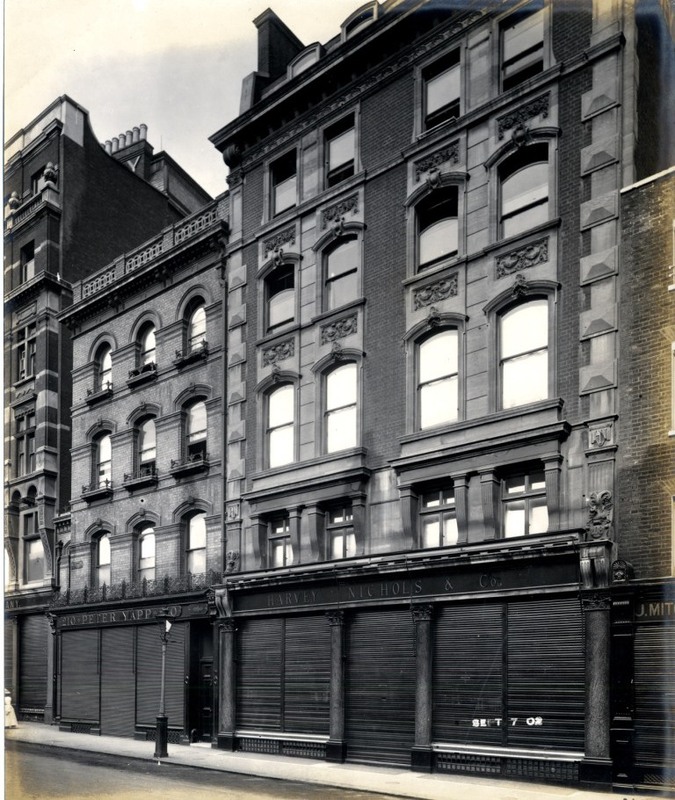 I’m sure someone could tell me why Woolland’s store and even the building they traded from is gone and almost forgotten while Harvey Nichols is a location and a brand known around the world. Businesses are as subject to the processes of history as people. I have one last stop to make, back to New Street (now Basil Street) off Sloane Street. I want to see if I have any relatives inside. I could have a look at the Handy Shop while I’m in the neighbourhood. who knows what they might have on their shelves? Photographers unlike painters or engravers often have no idea of the uses their creations may be put to once out of their hands. Vickie and Nance (see lists of posts opposite) had no idea that their holiday snaps would one day be spun into a kind of narrative by me. That applies to many of the others whose images you can see on this blog such as Kate Pragnell (Games for May) and possibly even James Hedderly (although I think he had a definite eye for posterity). This week’s photographer is another case of the unconscious artist. The photographs were all taken early in the morning, before many people were about. Shops are closed, some of the shutters are down, and curtains on the upper floors are drawn. 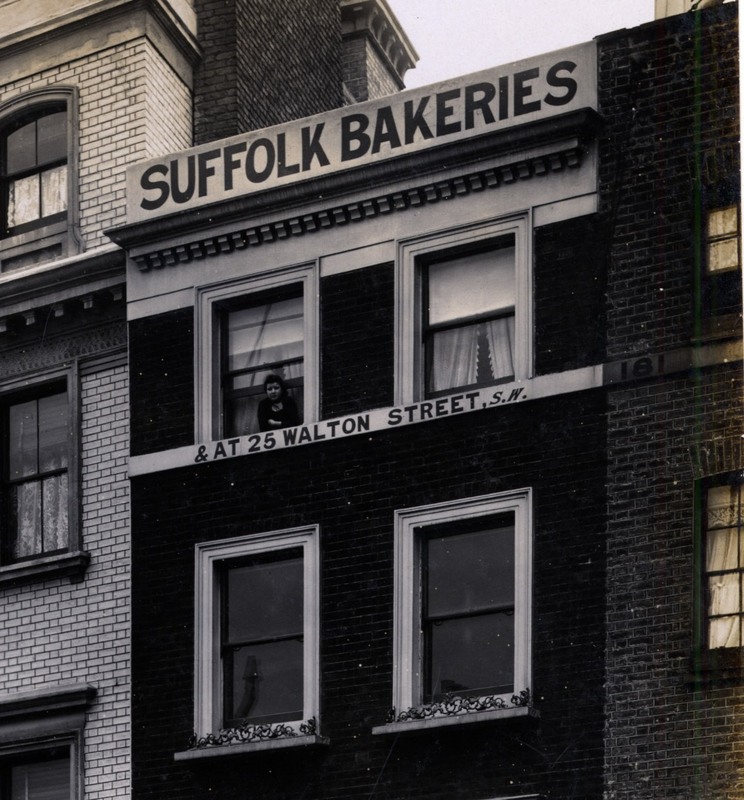 He was interested in the buildings not the people in them or the people passing by, or even the signs and banners of the shops and businesses. He wasn’t interested in rain on the pavements or the early morning light or the calm atmosphere of the empty streets. 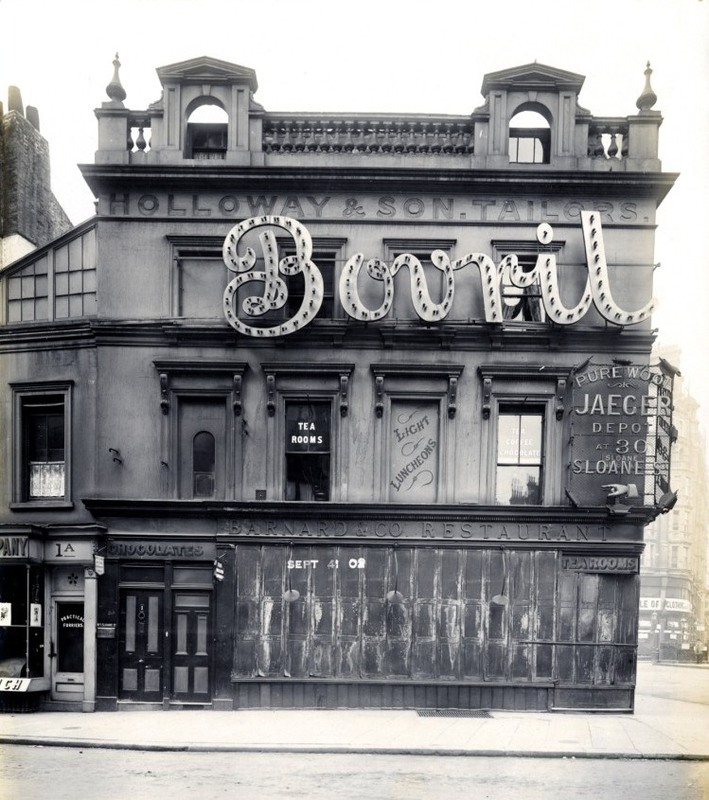 He’s caught some impressive architecture in the process of his work such as this now vanished building which would have been impressive in any Edwardian high street. Or this somewhat sinister building. The highly decorative façade looks decayed as if it belongs in a horror story, an impression enhanced by the closed shutters, deserted pavement and even the condition of this particular photograph. 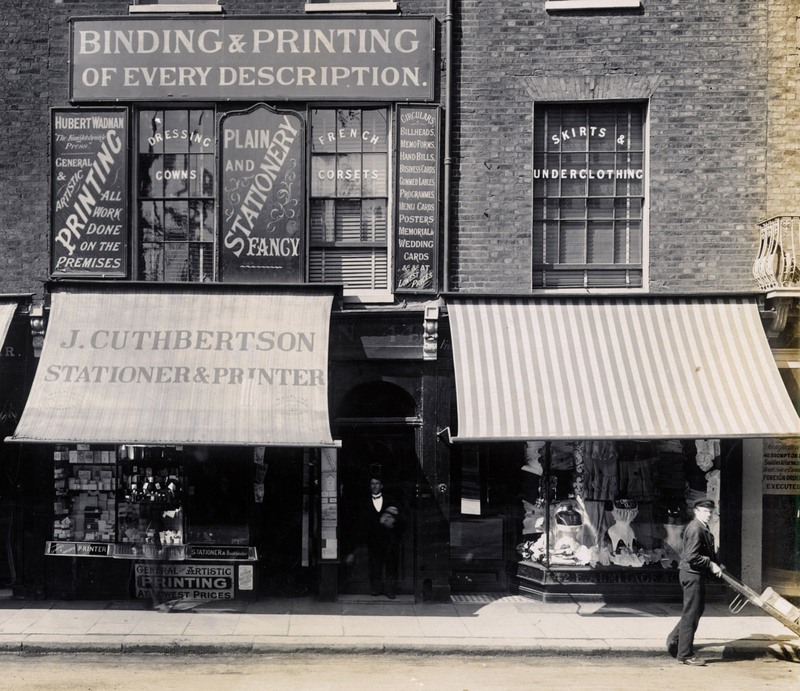 The other feature which catches our attention is the shops themselves which offer products we see less of these days, and services we no longer require. The signage has an insistent quality which is still part of retail life however curious some of these examples appear. 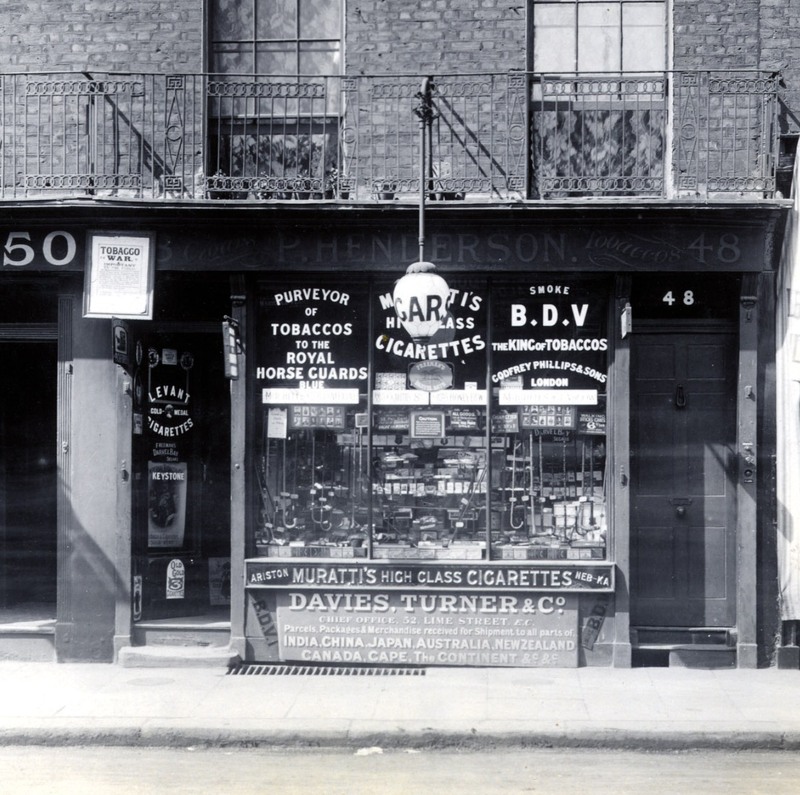 The tobacconist and his high class cigarettes. Gooch the boot maker also has an extensive range of travelling accessories according to the sign on the left. People do get into the pictures though. 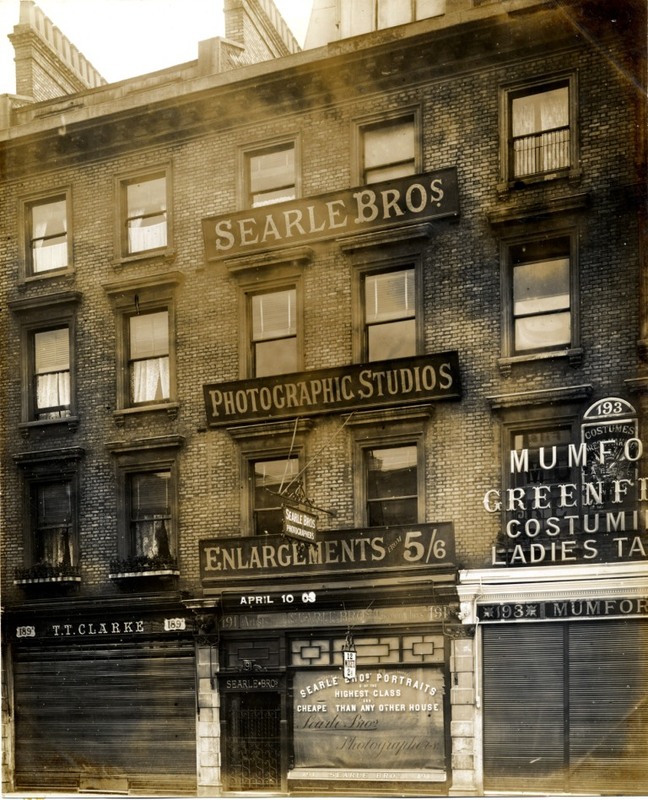 Photography attracted interest in the early years of the 20th century just like television cameras do today. Once I started looking carefully I saw plenty of early morning people. The policeman on his beat stands to attention as his picture is taken. 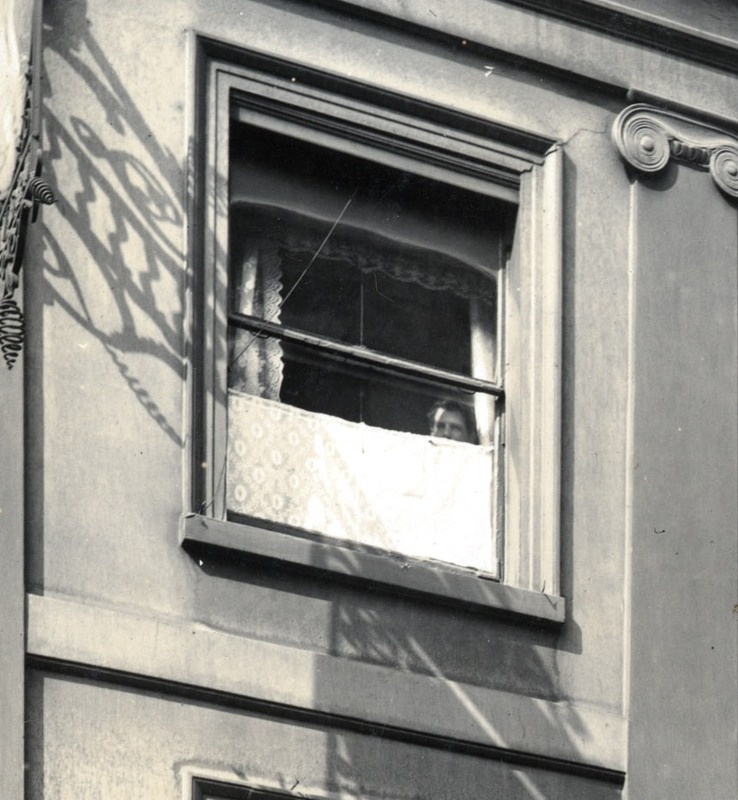 A woman leans out of a window taking a moment to stare out at the street coming to life before the working day begins. 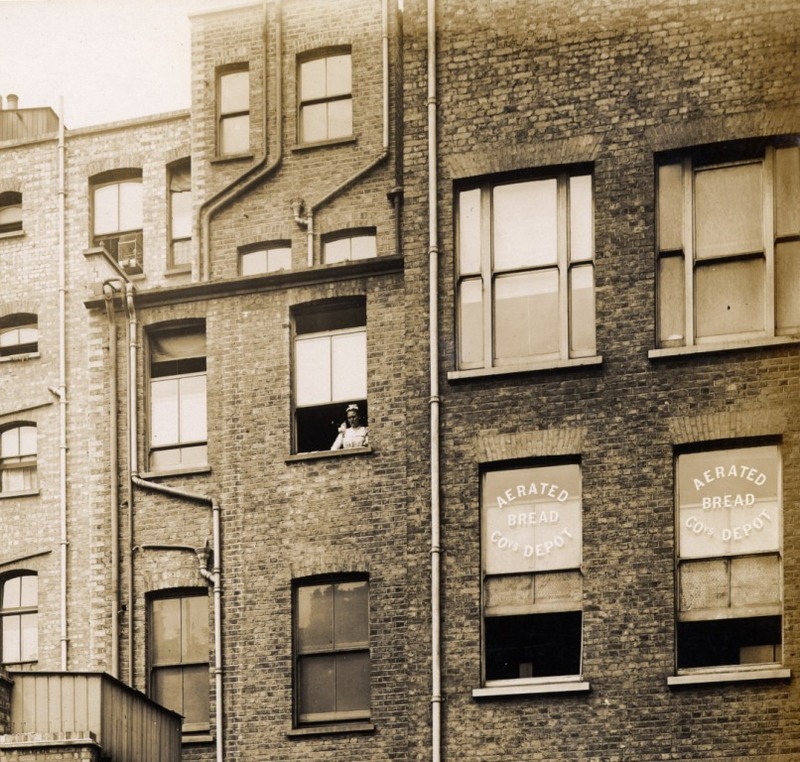 At the back of 47 Brompton Road next door to the Aerated Bread Company Depot another woman in a maid’s uniform is at the window, her working day already begun. Look above her to the left. A cage placed in a window so the captive bird can get some fresh air. 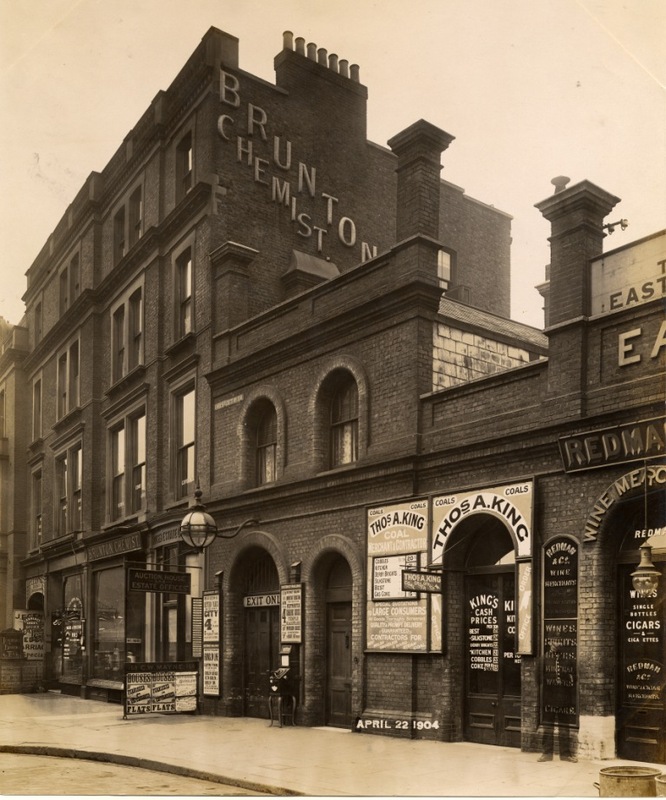 This was in the days when the air above Brompton Road was still fresh. A delivery man with a barrow pauses to look at the photographer. The man in the doorway looks like a waiter. Is he on his way to work, or just coming back to his room on one of the upper floors above the stationers or the corset-maker? Here is a man on a ladder, precariously perched half way up a tall building. Not window cleaning I should think, but I’m not quite sure what he’s doing. There’s room for speculation. This photograph gives a clue to the photographer’s mission. 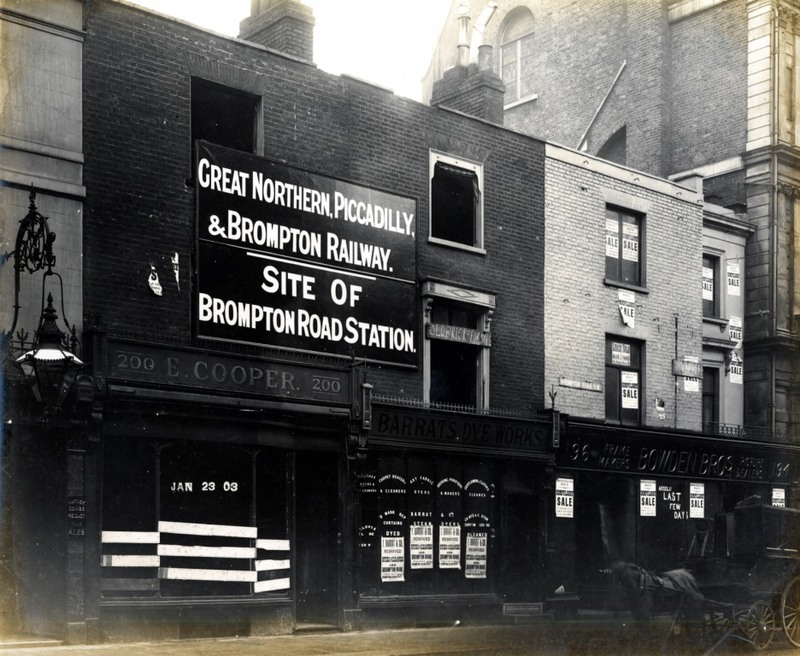 The Great Northern Piccadilly and Brompton Railway Company were in the process of building the Piccadilly Line. 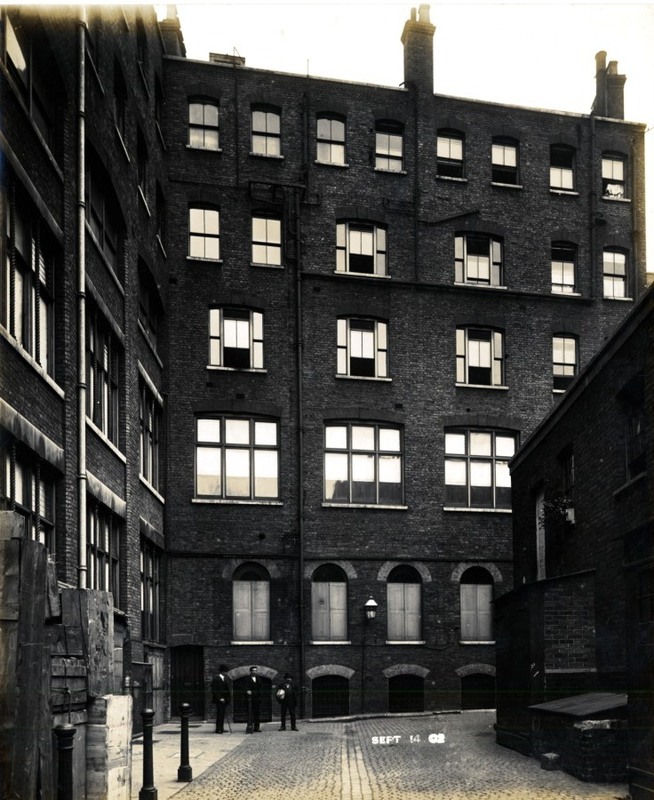 The photographs formed part of a legal record of the condition of the buildings above the new line. But they have come down to us as another kind of record showing us a London street coming to life in the early years of a new century.